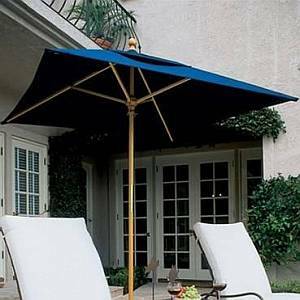 Made In The Shade Market Umbrellas by Galtech are made with the finest materials available, including first-grade Indonesian Hardwood and 100% solution-dyed Sunbrella fabric canopies that combine for an umbrella that will bring you years of enjoyment. This 6ft square 6 ft x 6 ft Cafe Market Umbrella can be found outside many fine establishments across America. It is available with a light wood pole only. Several canopy colors are available in Sunbrella fabrics. You'll find this umbrella is decorative and creates a European market look. The bar height pole is an optional 2nd bottom section of the umbrellas pole. It is 9 inches taller than the regular pole which adds to the overall height of the pole for use with a wet bar or a bar height table. It is highly recommended for commercial use. Available in light wood only, this 6ft x 6ft square umbrella is very charming yet durable enough for commercial use. Optional Bar Height Pole: This is an additional bottom section of the umbrella's pole. It is 9" taller than the normal pole, which raises the umbrella 9" taller to accommodate a table or a bar that is of standard bar height.